We list five factors that you must consider before choosing the best demat account. Read on! Opening a demat account is the first step for participating in the equity markets in India. While the trading account facilitates transactions, the demat account enables one to hold shares in custody. In a demat account, you hold shares and other securities in electronic form. Thus, in this aspect, it is similar to a bank account. The only difference is that while the bank account holds cash balances, the demat account holds share balances. When we open a bank account, we are more concerned about convenience. Normally, we choose the branch closest to our place of work or residence. Do we use the same logic while opening the demat account? Not really. The demat account is always linked to your trading account; hence, for simplicity, ensure that you maintain your demat and trading account at the same place. Here are five factors that you need to consider before choosing the best demat account. Sebi has mandated a detailed process of opening a demat account that the service provider must follow. However, the service providers can also simplify the process to a certain extent. For example, the demat account can be opened through the e-KYC process, wherein the entire process of account opening can be authenticated using your Aadhaar data. The e-KYC process is undertaken online, and the client only needs to do a final self-identification either through a video camera or through in-person verification. In e-KYC, the time to trade must be less than 2 days, while in a physical account opening, the time to trade must be less than 5 days. Are the charges for maintaining a demat account economical? Demat has a cost, even if it means keeping your account idle. Today, there are no charges for opening a demat account or for credits to it. When you calculate the cost of demat, you need to look at the complete range of costs. There is an annual maintenance charge that is billed to your account every year. Each time there is a debit from your demat account, a cost payable is charged. Additionally, there are costs involved if you request for a physical copy of the demat holdings or a physical transaction copy. Your demat account also incurs a cost when your debit instruction slip (DIS) is rejected or when your demat request form (DRF) is rejected. In addition, your demat requests are charged on a per certificate basis. You need to look at all these costs when opting for a demat account. At a time when trading in equities is increasingly shifting to internet and app trading, the need for seamless interface with banking and broking becomes paramount. There are 2-in-1 accounts and 3-in-1 accounts. The 3-in-1 account links your bank account, demat account, and trading account and is offered by brokers who also have group banking licenses like Kotak, SBI, ICICI, and HDFC. But most 2-in-1 accounts offer a seamless way to transfer money and then an interface between trading and demat which is equally good. As long as the customer can get a clean interface between trading and demat and a simple and economical money transfer service, the purpose will be adequately served. Increasingly, depository participants (DPs) are extending their services beyond plain vanilla account statements. DPs are beginning to provide a host of online analytics like real-time valuation, direct call-to-action for trading clients, timely alerts, analytics on demat inflows/outflows, industry concentration, and thematic concentration, among other things. These are value additions, but as a client, you must insist on these additional advantages. Before you zero in on your demat account, you must certainly look at the following hygiene factors: How quickly does your DP manage the dematerialization of physical shares? Do your demat debits and credits happen on time? What is the general opinion about the quality of services provided by the DP? Are there service-related complaints pending with Sebi or NSDL/CDSL and how serious they are? Is the DP in the news for the wrong reasons like depository investigations, Sebi investigations, etc.? These hygiene factors demonstrate the commitment of the DP to high service standards. 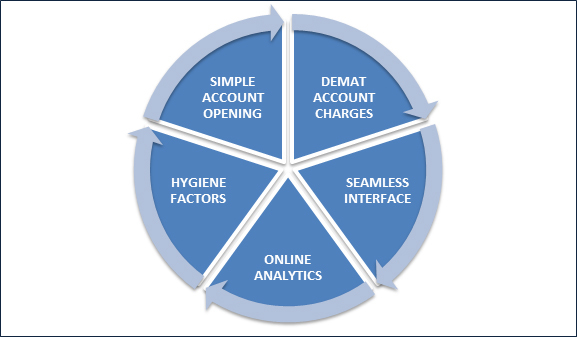 A quick review of the above five factors can be a good starting point to choose the best demat account.